Unfortunately, our extra harsh upstate winter was too much for our bees – they didn’t survive. We got 2 new packages of Russian bees and installed them in the hives last week. 1. Prepare a box full of frames, with an empty super on top of it. 2. Pry off the cover that is stapled onto the package. 3. Remove the queen- she will be in a little box with a few attendants. 4. Pull out the cork. There will be a sugar plug behind it – leave that there. 5. 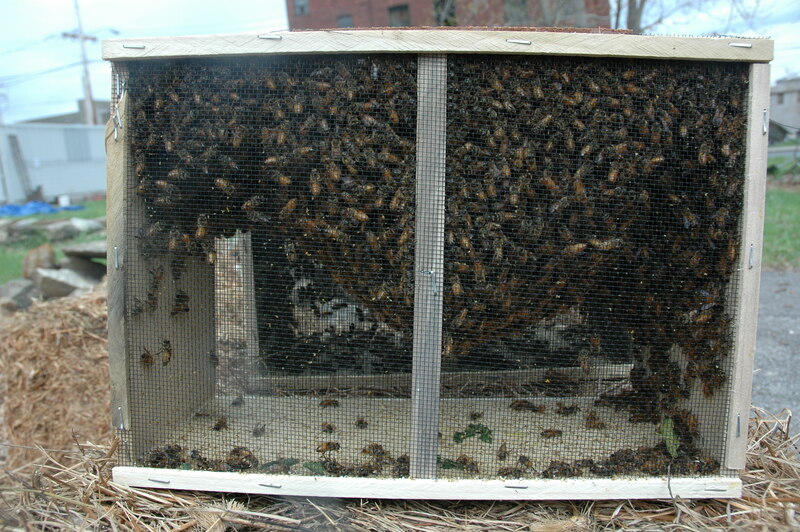 Put the queen in the middle of the hive body- she can be laid on top of the frames or attached to them. Make sure the bees will be able to access her screen, and the sugar plug. 6. Take the can of sugar water out of the package. 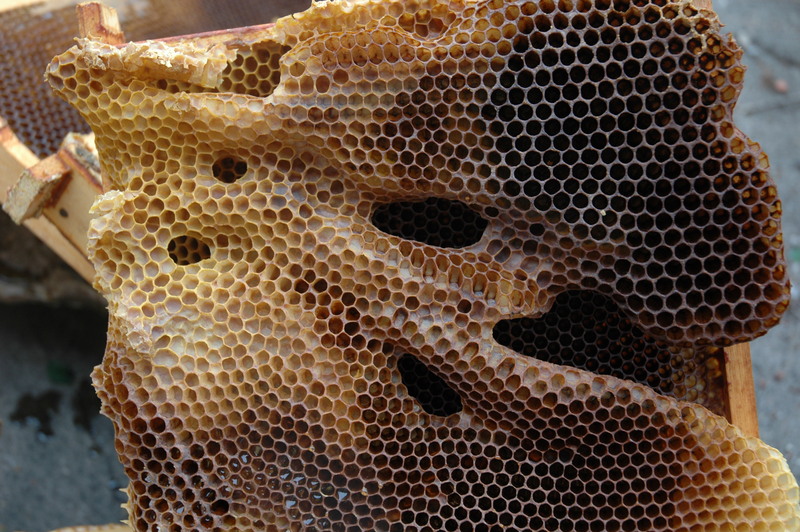 Put it holes down on top of the frames – so the bees can still feed off it. 7. Shake the bees through the opening where the can was, into the hive! 8. Put the cover back on the hive. 9. Feed, feed, feed! Use a 1:1 Sugar to water mix. Don’t heat the sugar or it caramelizes. Use either a bought feeder or a mason jar with some hole poked into the lid (like the can). Feed until the bees aren’t taking it anymore. 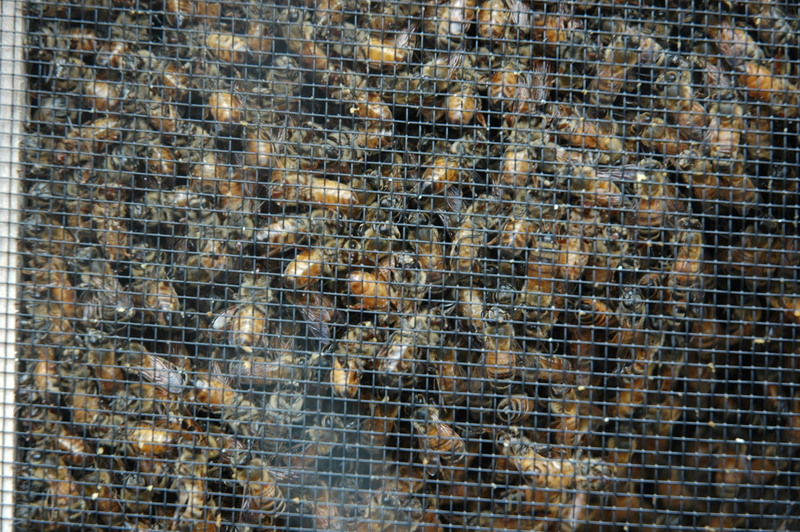 The queen is in her own cage because it takes the bees a little time to get used to her and recognize her as theirs. This usually happens by the time they eat through the sugar plug in her cage and let her out. I appreciate for very helpful guideline installing package bees. The valuable information you have been able to share us through this post.